Saul the Largest Sticker Ball was born from the idea of the first ever National Sticker Day, which was first officially celebrated on January 13th, 2016. 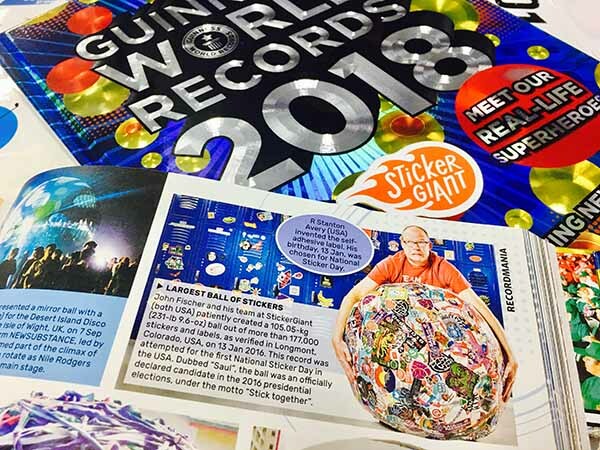 In celebrating a day of stickers, we decided to attempt the Guinness World Records of the Largest Ball of Stickers. Not only did we achieve that goal by the date in my mind, but the sticker ball became part of Team StickerGiant and took on a personality of his own. Saul’s name was affectionately inspired by our production team based on the character from the tv shows Breaking Bad and Better Call Saul, and can be found with the #SaulGood in all of the popular social channels. Starting with a small batch of balled up stickers, Saul the Sticker Ball grew to a record holding size in a matter of months. He went home with employees for weekend field trips with the goal of growing even larger, and we all learned tricks along the way in the secrets of building a giant Sticker Ball. This included learning how to make sticker patches, perfecting the rounding roll of Saul around the shop to keep his shape, and even working in small teams to competitively build Saul's size. Through all of this, Saul also became a celebrity in his own way with public appearances and staring at events encouraging people from all around to come and slap some stickers on him, and help him grow. In fact, Saul became an even bigger celebrity than any of us could have imagined, with national media attention on USA Today and Late Night with Seth Myers. Now, Saul the Sticker Ball is the greeter here at StickerGiant and loves it when people stop by to slap their name on the ball and help him to keep growing. He also likes to get out to fun events that StickerGiant is involved with and loves to ride in his wagon for these occasions. Follow us on our Facebook page for updates on Saul, and your chance to catch him at his next public appearance. Want to learn even more about Saul's Story? Check out our video on Making Saul: Behind the Scenes to see his story, features of his press appearances, and how he became such an important part of the StickerGiant Team.